We bring to you amazing pieces about the latest trends in technology and keep you up to date! Dive into the Potpourri of the web world and get to know it better with us! As we are already familiar, the power of Artificial Intelligence is touching all the dimensions. This year AI power is going to influence customer segmentation, retargeting, push notifications, click tracking, with enhanced possibilities. The AI technologies are now going to affect the search power by utilizing data from social media platforms and blog posts. It will elaborate a business perspective to find targeted customers and required products and services. In the year 2019, more than 42% of marketers are going to use AI for business recommendations, and nearly 50% of internet marketing campaigns are going to utilize AI. Another area of use is customer service by monitoring their interest. There are more than 41% of businesses which are going to use AI in their core marketing processes. Real-time personalized advertising insertions and optimization of message targeting are going to the new additions in the digital marketing field. The future AI-powered image search shopping displaying high quality, dynamic display of product images will make use of online robots and machine learning techniques. Looking at the current scenario, we can say that the businesses adopting AI technologies in 2019 will accelerate their growth. They will be getting an edge over their competitors. Connecting to your customers using social media practices is not the only technique. Some of the customers don’t like to give the actual response. In this case, social media campaigns face challenges by not getting the expected results. Chatbots are the robots using Ai techniques which communicate with the customers as per their terms. Many websites such as Amazon and Flip kart who are dealing with many customers have already implemented Chatbots. In the year 2019, the Chatbots will in frontline and directly affecting digital marketing results. A Chatbot can provide more useful results which a customer care executive can never achieve. In digital marketing, Chatbots are used to keep track of the customer’s choice and to deliver organized personal services. If you are planning to incorporate Chatbots in your business in 2019 either for sales or for customer’s help, you need to be aware that Chatbots are not meant to replace multiple human conversations. They can help, but they are still evolving and improving, and it will take some more time. By the end of 2020, most of the searches on Google are going to be voice searches. The adults are using the voice search to a more significant extent than the kids and youngsters. If you are targeting to implement voice search on your website in 2019, then ensure the site is SEO friendly, and its rating is high in Google ranking. To implement voice search connectivity, it is compulsory that your website should load first before any competitors website opens. Make sure that your site is using HTTPS. Another vital precaution in using voice search is to use precise answers to the customer’s queries. The use of voice should be done in perfect accord to keep the customer’s behavior in mind. Whether he is looking for an elaborated answer to his question or wants one sentence answer? The final purchase depends on your response. In a way, by applying the voice search module, you have to face the customer directly, you can wait and find answers in a manipulated way. It demands the entire business process to be transparent. The initial benefits which attracted people to perform voice search are the fast response, easy access, more beneficial for mobile uses and so on. The evolution of high-quality speakers has made it even easier. This trend is going to stay in the coming year. -Optimization of content for long-tail keywords as the voice search is comparatively long. -The site must be made content conventional as most of the searches are based on unknown customers. Both the parties ( caller and responder) don’t know each other. -The voice search depends on the clarity of sentences hence for the excellent responses; the convictions should be clear and specific to the search. Factors like loading time and site organization are also becoming more critical in an age of quick, on-the-go mobile and voice search. -Voice search will likely increase the sensitivity of search engines. It becomes mandatory that every image, video, and piece of content is tagged with meta descriptions and alt-text. Search engines use these bits of information to categories and serve up your content to users promptly. Without them, you can’t perform an active voice search. The cost of online advertising is touching the sky high limit, and the trend will continue in 2019. Conversion optimization is going to be the only way to increase direct sales. The more you optimize your landing page for conversions the favorable will result. Make sure you’re using advanced tools to do A/B testing so that you can squeeze more conversions from the traffic you’re getting. Another way is to merge email conversions to add in sales. It will help in increasing the ROI by increasing site traffic. IT is going to be a priority in 2019 to compete with business competitors. The main focus to drive more business should be on conversion in 2019. The people using the podcasts are going to be better buyers as their average income is quite high. To have a big business in 2019 or to expand your dimensions, you need to create a podcast this year. Podcasts help to deliver the content with a loud message when the person is on the go. In the busy and hectic schedules, the use of podcasts is likely to increase in 2019. When people are active in doing some other task, you voice over the podcasts can help you advertise your business. The latest digital marketing trends have more focus on local influencing marketing in 2019. The Life span of an influencing product in the global market is for a short duration. So, it is better to tie up with a local influencer to plan together long time campaigns and online promotions. Make use of social media platforms. Follow your competitors and learn about them. Try to establish a communication link with the help of social media. This influencing marketing might lead to a joint venture which can be profitable with your business. The video is still a fascination among internet users and the top channels. The trend of live videos is, however, capturing the attention of website owners and customers. The pattern is going to stay for a long. To create customer’s choice videos, get into the shoe of the ordinary user and think of what kind of information they will be expecting in a video. Release product demos, Live Q/As and another promotional video for receiving instant responses from customers. To make a compelling video, first, create a strong content strategy by scratching your brains to put relevant content. Keep in mind, that video is a starting point for marketing and promotion of your product. Step two is to pick the platform which can be useful for your product. Right now, most of the businesses are focusing on YouTube Live and Instagram as space is less crowded. Ensure that the videos contain fun, engaging and great experiences for the audiences. Video content is the future of digital marketing. The enthusiasm to watch a live video is always more than merely reading the test or a still visual. So, to stay in your business, you need to create leveraging videos. The time has gone where anything would have worked. The mobile devices are driving a great business. The mobile wave has captured more than 60% sales which we can’t ignore. The second selling channel is Google. In 2019, the priority is to increase Google ranking by reducing the load time of the website. The required speed is initiated by using AMP pages which load in less than0.5 seconds creating a good experience in comparison to mobile pages. Progressive Web Apps (PWA) exists as a middle ground between your official responsive website and a native app. PWA is an excellent technique to bridge the gap between the mobile app and website pages. The use will continue to grow in 2019 balancing the mobile and web applications. AMP allows your site to render fast to improve website ranking on Google searches while PWA eliminates the high cost of building a mobile app and provides the same great experience to visitors on your mobile site. The users view ads on the website ever since the evolution of the internet. The website visitors get pop up ads that interfere with their user experience. For a long time, the increasing number of ads has started bothering users. The number of users blocking the ads has increased. The alternative to online ads is native advertising. The look of a native ad is like a web page, and they are not like usual advertisements. Social media and Amazon are promoting native apps. The amount spent on making the name Users can create a shortcut on the apps is going to get doubled this year. They will further expand as the use of social media will become more prevalent. i). Convincing Power: With user-generated content, your current customers are marketing your products for you. It’s like a word-of-mouth campaign. Your customers start feeling attached to your brand, and they connect to you in a better way. ii). Freeware is the first choice: You don’t have to spend on this type of marketing. It has more power than your other marketing channels. People love to enjoy free things. The whole idea is to make the customers aware of using the products. Once he is convinced, your work is done. After this, direct advertising has a little effect on online business. All of us must have felt this power which is influencing the digital market. In 2019, the focus will be on producing actual based original content. The year 2019 will be about better customer interactions with personalization, automation and AI-powered technology. To stay ahead in the digital marketing curve is to increase conversions in 2019. The focus will be on attracting more customers by using conversational content (Audio and Video) and to built applications for the targeted audience. 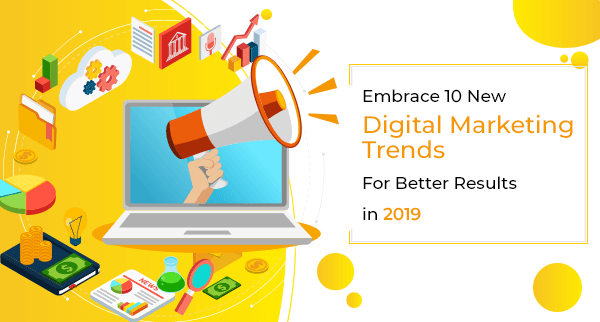 Let’s gear up ourselves to have an exotic digital marketing boost in 2019!